Drinking Tea Can Turn Genes On or Off in Women | What is Epigenetics? Green, black, white, oolong, and rooibos – these are all types of tea many of us have enjoyed for their power to soothe or energize. But did you know that sipping on some tea could lead to epigenetic changes in your genes, especially in those linked to cancer? A recent study supports the notion that tea might be a key player in modulating a person’s disease risk by decreasing inflammation, suppressing the growth of tumors, and influencing estrogen metabolism – which are mechanisms that can be mediated by epigenetics. Epigenetics is the study of alterations in gene expression as a result of chemical marks that do not adjust the underlying genetic code. We know that lifestyle factors such as what we eat, whether we exercise, and our exposure to environmental toxins can all lead to epigenetic changes and affect our health. Want to know how foods epigenetically influence health? 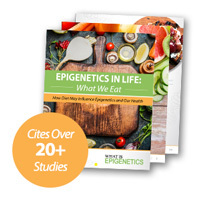 Take a look at our e-book Epigenetics in Life: What We Eat, which cites over 20+ epigenetic studies. For instance, casticin, a type of flavonoid found in fruits, can change chemical tags on DNA to stave off gastric cancer. Consuming vitamins A and C has been shown to erase methyl marks and could potentially lay the groundwork for a reprogrammable cell. A high fat, low carb diet might also open up DNA and improve mental ability in some people. With more and more research, we are finding that diet in particular plays a significant role in epigenetically influencing our health, and perhaps even the health of our children. A mother who drinks green tea during pregnancy might even improve her child’s development. According to the Tea Association, hot or cold tea is consumed by over 158 million Americans on any given day. It’s considered the most widely consumed beverage in the world next to water and contains no sodium, fat, carbonation, or sugar. Based on published research, numerous varieties of tea may slow down neurological decline, help with weight management, and even protect against cancer. A new study conducted by researchers from Uppsala University and colleagues from around Europe showed that women – but not men – who consumed tea had epigenetic changes occur in DNA collected from their blood. Specifically, the researchers measured a common mechanism known as DNA methylation, which influences the suppression of genes. The team found that a total of twenty-eight regions were differentially methylated in women who consumed tea versus those who did not. According to the researchers, these regions contained genes known to interact with estradiol metabolism and cancer. They uncovered two individual CpG sites, DNAJC16 and TTC17, that were differentially methylated. Although the study also assessed whether coffee could impact gene expression, unfortunately, the group didn’t find any significant associated epigenetic changes in men or women. The results highlight an interesting role for tea ingredients which could potentially be used in pharmaceuticals related to cancer and estrogen metabolism. Additional research is needed to determine whether tea can truly bestow epigenetic health benefits. However, this study combined with previous research on tea catechins and epigenetic changes brings us closer to understanding the impact one of the most common beverages could have on improving our well-being. Source: Ek, W.E. et al. (2017). Tea and coffee consumption in relation to DNA methylation in four European cohorts. Human Molecular Genetics, 2017. Reference: Koffmar, L. Tea consumption leads to epigenetic changes in women. Uppsala Universitet. 31 May 2017. Web.